Ever wonder what stone is considered the hardest of them all? Well, the diamond is considered as the hardest in terms of mineral stones having garnered a hardness scale of "10" in the Mosch scale. The diamond is also the birthstone for the month of April, and considering the characteristics of the diamond, the stone is surely the perfect representation for people born under this month. The stone was once considered reserved only for the kings and elites of the society. With the King of France, King Louis IX, passing a law which makes the stone exclusive for the king. The Greeks, one of the greatest civilization in the world, consider the stone as "tears of the gods" and are worned by their rulers to ward off evil and provide protection especially during battles. The Greeks also considered the stone as a symbol of everlasting love which safeguards the stone's status as the ultimate "love token". The diamond one usually finds in jewelry stores are all colorless, however, there are diamonds of different colors ranging from pink, to black to blue and sometimes color can determine the price of the stone itself with the rarity of the color increasing the price tenfold. Reddish or greenish diamonds are also available although it is of rare variety and thus commands higher price in the market. Diamonds are available in two types, the natural diamond and imitation diamonds. Natural diamonds are mined from different volcanoes which can be found in different parts of the world, although the concentration of the mining comes from South Africa and Russia. Diamonds are often lodge in Kimberlite rocks which are commonly found in the thicker part or area of the volcano's crust. Another variety of the stone is the imitations or fake diamonds. Most of the diamonds are laboratory made. 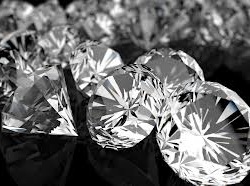 These stones such as the cubic zirconia, spinel, topaz, sapphire corundum and beryl are just some stones that are oftenly mistaken as diamonds. Other faked diamonds include ones made from cut glass and quartz.